HELL on EARTH , is it MAN-MADE? Here in the video below we are looking at nuclear hell on earth, a night film of the radioactive steam that continues to rise from Fukushima 24 hours a day. Arnie Gundersen, a former nuclear power industry executive, is one of the experts who has been saying from day one that the nuclear crisis in Japan was much worse than they were telling us. After the first week, officials had enough information to call for evacuation of a wide area in Japan and also Hawaii, Alaska and the entire west coast of North America. They really should have evacuated all of northern Japan and also the west coast but that was almost as impossible as evacuating the entire planet or the entire northern hemisphere. Evacuation of planet earth might be the best way for humanity to avoid the terrible nuclear, heavy metal and chemical toxicity we are now facing all at the same time. Avoiding exposure is always the best plan but there is no way to avoid breathing in air contaminated with tiny hot particles. Inhalation issues are much more frightening than ingestion issues because you can pick and choose what you eat and drink but you can’t buy bottled air. Nuclear Toxicity Syndrome is about how to survive in nuclear and chemical hell. But one cannot do what is necessary to survive hell if a person doesn’t know they are living in one. 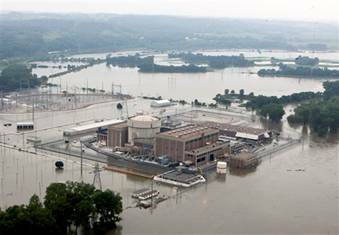 It just keeps getting worse by the day and now we have Fort Calhoun nuclear plant outside Omaha, Nebraska on emergency alert as first fire and now flooding threatens to overwhelm yet another nuclear facility. With Mother Nature now angry (in a most bitter sense) we are really in more serious trouble than any of us would be comfortable imagining. We knew nuke power plants were bad news but who would think they would build them on fault lines or in flood zones? That’s Mr. Gundersen’s way of saying, yes, there are definite risks tied to these “hot particles.” But that really does not answer the question. I am afraid I will have to be brutally honest and be the bearer of really terrible news. The information coming out about hot particle concentrations near Fukushima, Tokyo, and now Seattle tell us that not only should all those populations be worrying but their governments should have been issuing evacuation orders months ago. CNN’s John King interviews Arnie Gundersen about the Hot Particles discovered in Japan and the US. Fairewinds Associates ON Vimeo. CNN’s John King interviews Arnie Gundersen about the Hot Particles discovered in Japan and the US. from Fairewinds Associates on Vimeo. They did not of course except in a too-tight circle around Fukushima, which is getting 40 times more than in Tokyo or Seattle. Because of the jet stream in April, after the large explosions that destroyed three reactor buildings, it was as dangerous in Seattle and much of the west coast of North America as in Tokyo. It only takes one of these particles to trigger a cancer. A new report from independent scientists in Japan found a much greater release of “hot particles” from the Fukushima power plant than originally estimated. These include radioactive isotopes of cesium, strontium, uranium, plutonium, cobalt-60 and many others. The average person in Tokyo is thought to have inhaled 10 “hot particles” per day throughout the month of April 2011. The inhabitants of Fukushima were estimated to have inhaled 30-40 times more than that—or up to 400 hot particles per day every day that month. In Seattle, WA in the Northwestern U.S., it is estimated that the average person absorbed five “hot particles” per day during the month of April 2011, or 10 “hot particles” per day if they are athletes who are working out. These invisible atomic particles become lodged in your lungs, intestines, bone or muscle. Professor Christopher Busby, scientific secretary of the European Committee on radiation risks, says that fuel rods at Fukushima got blown sky high, that concentrations of uranium and plutonium particles had been detected in air filters in Hawaii and the Marianas Islands by the end of April. So people knew about this but they were not talking. A ‘hot particle’ is defined as an alpha-emitting particle that contains sufficient activity to deliver at least 1000 rem/yr to the surrounding lung tissue. Severe damage and disruption of tissue in the lungs are associated with exposure to these types of nuclear particles. The most relevant lung experiment is Bair’s Pu 23902 inhalation study with beagles. Twenty of the 21 dogs that survived more than 1600 days post exposure had lung cancer. The government recommends that the maximum permissible lung particle burden for members of the public be 0.2 hot particles, and the average lung burden for members of the public be 0.07 hot particles, a factor of 3 less than the maximum. Let’s say that the official numbers were five “hot particles” per day (10 if one is physically active outdoors) for everyone on the west coast for the month of April. Now let us be very conservative and say that this has dropped from the initially high post-explosion levels at Fukushima down now to one a day. At one a day that would still be 30 of these death particles a month. So perhaps the average person has already absorbed in these three months approximately 200 radioactive particles into their lungs and other tissues. When you think that if even one of these 200 is plutonium, we have to think in terms of millions of eventual cancer deaths! All of these hot particles will burn the local tissues. They will compromise health in a myriad of ways. But doctors will stand by not having a clue what to tell their patients to do except receive more radiation diagnostic scans and more radiation treatments for cancer patients. The allopathic paradigm will not survive Fukushima because it is utterly ignorant about the approaches that stand a chance of helping us get through this. Gundersen says, “That’s why we were warning you to wash your lettuce and things like that. Now what that means is that these hot particles can lodge in your lung or in your digestive tract or in your bone and, over time, cause a cancer. But they’re way too small to be picked up on a large radiation detector.” This is one of the reasons many people felt something wrong in the first weeks after the radiation started pouring out of Japan. Sensitive people will register such an invasion of hostile chemical and radioactive toxicity even though radiation detectors will not. Gundersen understandably would have a hard time telling people how bad it really is. He is not a doctor but he knows full well what only one particle of plutonium will do to surrounding lung tissues. How does anyone tell 200 million people to get out of Dodge or tell them it’s already too late since health-damaging contamination has already taken place? Evacuation is the only way to avoid continued exposure but hardly anyone perceives it this way. I received a letter from someone in southern California today asking if it was okay to go to Hawaii for a vacation. My real answer to her was you should abandon not only your travel plans but also your home in L.A. and move to the southern hemisphere. “Geiger counters simply cannot measure whether or not someone has ingested a hot particle but we know they’re here because the air filters have measured these radioactive particles and they’ve been found in the topsoil, in water supplies and in the milk produced on both coasts of the U.S. This suggests that the same would be true of the meat of any livestock raised outdoors—and of the vegetables grown outdoors,” says Gundersen. A photograph of a monkey’s lung is shown, with a major depression at its center where a “hot particle” is embedded in the tissue. This is a photo of a “hot particle”, in this case a one-micron particle of plutonium, and it shows the alpha tracks emitted from that particle in one year. This particle has bombarded the surrounding tissue with radiation and damaged it quite dramatically—just one particle. Gundersen says the body will fight off an irritant such as this and it will usually win but sometimes a hot particle will cause cancer. They will all put wear and tear on infected people’s immune systems. You really do not want even one of these hot little pieces of sun burning in your tissues. 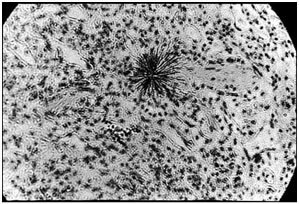 Plutonium in Lung Tissue: The dark, star-like image in the above photograph (magnified 500 times) shows tracks from alpha particles radiating from a speck of plutonium lodged in the lung tissue of an ape. Alpha radiation from plutonium and other alpha-emitting radionuclides can be blocked by skin or even a piece of paper but it is the most biologically destructive form of ionizing radiation when the alpha-emitting substance is deposited in the soft tissue of internal organs like the lung. The alpha tracks shown above were captured over a two-day period. These hot particles result in an intense but highly localized irradiation. The damaged number three reactor was in its first fuel cycle using MOX nuclear fuel with plutonium. If this MOX reactor goes into full meltdown spewing plutonium dust across Japan and everywhere else, it is lights out via cancer for anyone who breathes the stuff. The half-life of various plutonium isotopes ranges from minutes to 80 million years. Plutonium-239 has a half-life of 24,100 years meaning it takes that long to lose half of its radioactive potency—nothing compared to depleted uranium, which counts its time in billions of years. Uranium-235 has a half-life of 700 million years. And caesium, which tends to go airborne easily, has a half-life of 30 years. The fuel rods at all six reactors at the stricken Fukushima Daiichi complex contain plutonium. Only six percent of the fuel rods at the plant’s unit 3 were a mixture of plutonium-239 and uranium-235 when first put into operation. The fuel in other reactors is only uranium, but plutonium is created during the fission process. This means the fuel in all of the stricken reactors and spent fuel pools contain plutonium. Plutonium is super nasty stuff, especially damaging to lungs and kidneys. Inhaling or ingesting only one radioactive particle of plutonium can cause cancer. In Nuclear Toxicity Syndrome you will read about the dangers we are all facing, especially for those billions who live in the northern hemisphere. If you have not noticed, things are getting real dangerous out there and the media is going to make sure you are blindsided by events they will not inform you of until it is too late. This is a tough book and it’s going to face you with some very frightening information. Though the main thrust is nuclear radiation, we also will look at mercury as an invisible chemical cloud that has contaminated everything. Lead too is still a problem but they don’t inject lead into babies or plant it in people’s mouths like they do with mercury, a heavy metal more toxic than lead. Would you believe they are just now finally stopping the use of a drug (another heavy metal actually) that farmers have given to chickens for decades. Arsenic is being pulled off the market after federal scientists found a potentially carcinogenic form of arsenic in the livers of animals treated with the substance. In the past two and a half years thousands of workers, villagers and children in at least nine of mainland China’s 31 province-level regions have been found to be suffering from toxic levels of lead exposure, mostly caused by pollution from battery factories and metal smelters. In many areas of the world people are already at death’s door from chemical and heavy metal pollution. Pollution has reached a zenith and has gone even higher with huge forest fires that have released huge amounts of radioactive and chemically contaminated soil into the atmosphere. Then we added mega oil disasters and now nuclear hell on earth. Is there any nice way to refer to this disaster? Look at that video again above that is a vision of what human darkness can conjure up. We might as well have shot ourselves in the head. There is nothing for us humans to be proud of if we honestly sweep our minds across reality as it is presenting itself to us this year. For infants it’s a terrible valley of death we have created for them. As we shall see for years all of them have been born with already polluted bloodstreams and now the very young ones are dying in greater numbers since Fukushima blew up. Doctor of Oriental and Pastoral Medicine.